This lesson covers how satellite observations inform numerical weather prediction models. It begins with a basic overview of what satellite data types are assimilated and how, and ends with an overview of how data from new instrument's may make it into a model. 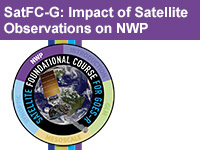 More in-depth discussions and a quiz on the impacts of satellite observations on NWP can be found in the COMET lesson, How Satellite Observations Impact NWP. Describe the process of assimilating satellite observations and retrievals once they have been accepted for use in DA systems.